This article may be reprinted/republished freely. Please share this information with others. Imagine this. You stumble upon a letter from a young man who could very well be your brother, your son, or even your neighbor. He is a marine and is stationed in the desert in Iraq. He has red hair…and a horrible sunburn. He desperately needs sunscreen and, while he can receive mail every week or so, he doesn’t have access to a store. What would you do? Then you find a note from a female soldier stationed in Afghanistan who has no family. While other soldiers in her area get letters and packages daily, she has never received anything. She doesn’t want food, clothes or toiletries. She just wants a pen pal or two. What would you do? Still another soldier wants to know if people from home can send him a couple of bags of candy or some inexpensive school supplies, like crayons and paper. He hands these items out to local Iraqi children to see them smile, but he’s starting to run out. 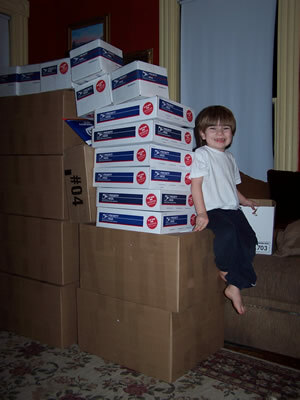 The nice thing about shipping goodies to our troops “overseas” is that you only have to pay domestic postage rates. So, you can mail a card to a soldier for the same stamp that you use to mail your monthly bills. Last month, we broke our all-time monthly revenue record. We wanted to share our good fortune, so we decided to adopt some overseas troops via AnySoldier.com. This is a website where the troops can login and tell people what they need (things like toiletries, sunscreen, and health items) and what they want (goodies like video games, board games, DVD movies and candy). We made a list of several items that specific soldiers needed, divided it up into categories, loaded the kids in the car and drove to Target. We each grabbed a cart and split up. Richard covered food and electronics. Frank handled toys and sports. Ali picked up socks, underwear and miscellaneous items, and I was in charge of toiletries. It took a couple of hours and four full grocery carts, but we found just about everything on our list. We even found some extra goodies, like whoopie cushions and other odd items, to make the soldiers laugh. If you want to give a soldier (and yourself!) a smile, but have always wondered if your package really will get to a real soldier, check out some of the posts by soldiers at http://www.anysoldier.com/WhereToSend/. While many soldiers need items desperately, some just want a pen pal or two. Adopt a soldier and send a letter or a care package. I promise, it’ll make your day.